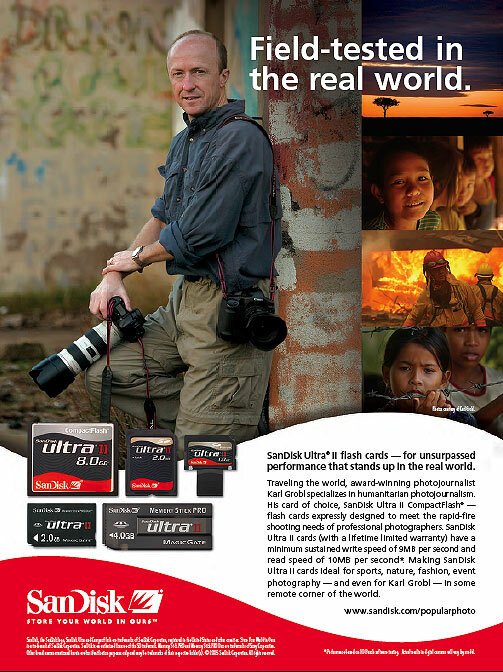 Well, as “poster boy” for SanDisk, need I say more? I have shot tens of thousands of frames in my Canon Mark IIs and Nikon 3DS all over the world; in all sorts of extreme conditions using San Disk Ultra II and Extreme III cards…they have worked flawlessly. I highly recommend them. I have also shot using Delkin Pro cards, they were reliable and trouble free too. Both Delkin and SanDisk are great companies and they stand behind their products…Lexar of course is another big player…although I cannot speak from experience, having never used their products, a lot of professionals use their cards and get great results. How much CF should you carry? Well even on my longest, most intense shooting days I rarely burn through more than about 4 gigs…that’s usually if I’m “machine gunning” stuff, to make sure I capture the exact moment of an expression or event. During my coverage of the tsunami, I shot from sun up to sun down and beyond and never shot more than 4 gigs. In my bag I carry a total of about 15 gigs of CF, primarily because if I have no way to download images, I can shoot for about 4 days. If I know I will be out longer than 4 days without the ability to download images to my computer, then I adjust my Canon Mark IIs to a smaller file size and can easily double the number images I am able to shoot. With higher compression (smaller file size) I have never lost the ability to sell the images. The Canon Mark II has an additional slot for SD cards, so I also have a pair of 1 gig SanDisk Extreme III SD cards in my cameras, as “backups”, but rarely end up using them. SD cards seem to be a bit less convenient for me in terms of downloading, since they do not fit in my Cardbus 32 PC slot CF Card adapter, and they feel a bit fragile and their diminutive size makes them easier to lose as compared to the thicker, more sturdy CF. Maybe, someday all professional digital SLRs will go to SD cards and this will be a moot point. In a digital world things change fast, so don’t fight it, enjoy the ride, it just gets better, faster, smaller all the time! 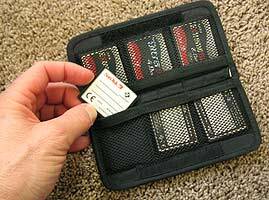 I store my CF and SD media cards in the Hakuba DSM 60 digital Media Card storage Wallet. It’s made of a Nylon shell wallet with a Velcro closure. The Interior has netted pockets that hold up to 6 CompactFlash or SD memory cards. It’s slightly “padded”. This wallet fits inside the pouch on the inside top cover of my THINK TANK camera bag. Since it’s a tight fit, even if I forget to zip the pouch shut, the storage wallet will not fall out. Another benefit is that by storing it here, the Hakuba DSM 60 provides a little bit of added protection for the back of your camera, should something fall onto it while it’s inside the THINK TANK bag. When I fill up a card, I remove it from my camera and place it inside the wallet with the logo side facing away from me. That way, I always know at a glance which cards have been used, and which are ready to go! The smart folks at Hakuba made the pockets out of mesh material so you can see through. When you’re in the business of working with cameras and camera gear on a daily basis; little things like this make a big difference.